Whiskey color vegetable dyed cow hide. Hand stitched with waxed linen thread. All edges are coated and polished. 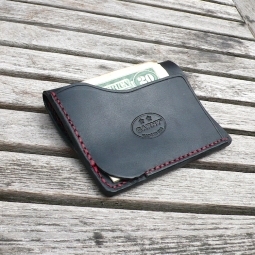 Left side for $ bills, right side 2 card slots on top and one larger under. 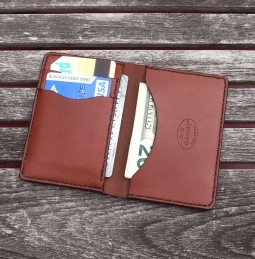 Designed to hold credit cards (about 10-12), drivers license. Please expect natural markings.